Which Route is Best for Me on Kilimanjaro? Berg Adventures offers three unique routes to the summit of Kilimanjaro. We avoid the busiest routes on the mountain to give you a more pleasant experience away from the crowds. Should you be interested in a route that is not listed here, please contact us. 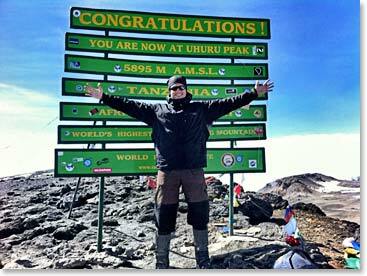 Regardless of the route, the objective is the same - to reach the summit of Kilimanjaro. At Berg Adventures, we love the Lemosho Traverse. If you are new to altitude, this route is a great option for you because we move more slowly to the summit giving our bodies more time to acclimatize. With this route, you have the unique opportunity to sleep in the summit crater at 18,700ft/5700m before attempting the summit. This means that your summit day will be relatively short and you will not need to start your climb in the middle of the night. Another advantage to the Lemosho Traverse is that you travel across Kilimanjaro and thus get to see a larger portion of the mountain. We start in the rainforest on the west end of the mountain and climb across the southern Shira Plateau before approaching the summit from the east side. Along the way you will camp at the beautiful Lava Tower and climb the infamous Barranco Wall. As you approach the summit, you will pass the shrinking glaciers on your way to Stella Point then on to Uhuru Peak. Those with excess energy after the summit will have the opportunity to further explore the crater rim before descending. We operate this trip many times each year. See our Trip Dates and Prices for a list of upcoming expeditions. If none of these dates work for you, contact our office about setting your own trip dates or organizing a customized climb. Private climbs are always available for an additional cost. This is the ultimate Kilimanjaro Itinerary if you like fantastic scenery, less crowded trails and varied terrain. We will begin on the beautiful Umbwe Trail, Kili’s most pristine forest trail. We will then cross beneath the fantastic Breach Wall of Kibo and visit the Lava Tower. We will traverse to the remote northern side of the mountain before we access the Crater via Gilman’s Point. Camping in the Crater itself will be challenging, beautiful and will allow for a brief, daylight climb to the summit. This route is available upon request. Contact our office for details. Barranco Camp on the Umbwe Circuit Route is one of the finest on the mountain. The Rongai Route begins on the forgotten north side of Kilimanjaro, the drier side of the mountain, and offers a direct ascent with shorter hiking days. It is an exceptionally beautiful route with a remote feel from the bottom all the way to high camp. On summit day you reach the Crater Rim at Gilman Point and continue along one of the most spectacular walks in the world to Uhuru Peak, the very top of Africa. On the Rongai Route you spend your first night in a beautiful lodge. The views high on the Rongai Route are spectacular.